One way that you can differentiate your business from the competition is by becoming an environmentally friendly lawn care business. Some savvy lawn care business owners are starting to brand themselves as 'Green' lawn care companies. And in this case 'green' does not just refer to the color of the grass that they cut or the color of the money that they rake in. Eco-friendly lawn care is definitely a growth market and several national franchises that cater specifically to this niche have sprung up in the past five years. Let's consider how you can benefit by branding your business as an eco-friendly lawn care provider. We'll also provide a few tips on the services that you might offer and how you can brand yourself as being eco-friendly. The big advantage for a lawn care operation to target this niche market is of course that people are prepared to pay a premium price. Wealthy households are usually sympathetic to environmental causes and should be prepared to pay a little more for this kind of specialized service. If they are not really concerned then they at least want all their friends and neighbors to think that they are concerned. Having your vehicle parked outside with your 'carbon neutral' lawn care service branding all over it is a great way for a household to let people know that they are a family that cares about the earth. One way to be more environmentally friendly is to use electric equipment instead of equipment that is powered by fossil fuels. The problem with electric equipment though is that it needs to be recharged and this can be a problem while you are out on the road. However, some lawn care operators are finding innovative solutions to this problem. At least one company has installed solar panels on their trucks for recharging their gear. 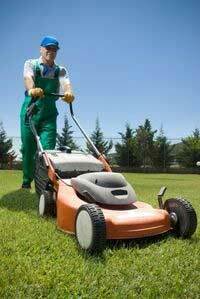 Electric mowers, edgers and blowers as well as a variety of other lawn and garden equipment are now available. They offer solutions that are not only quieter but also produce fewer emissions. Some lawn care companies are also using lawn mowers that runs on bio diesel. Your vehicles must also play the part and demonstrate that you are conscious of reducing your consumption of fossil fuels. Go for good fuel economy and consider getting a hybrid or an electric vehicle if you can get something large enough to fit your gear. Let your customers know that you use the latest route planning software to minimize your travelling time and fuel consumption. Other lawn care and landscaping businesses are taking an environmental approach by going into organic fertilizers. Made up from 100% organic material these fertilizers can be more expensive and sometimes not as effective. For this reason it is important to consult with clients on what they can expect from organic fertilizers to avoid disappointment. 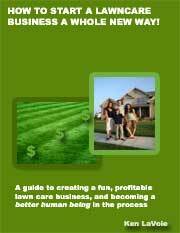 You can also go over the advantages of eco-friendly lawn care solutions with them too. Many households feel that these products create a 'chemical free' environment in their garden so that children and pets can play safely. The best place for leaves and lawn clippings to go is back into the local eco-system. You should encourage all of your clients to have a compost pile on their property. Then you can add 'compost maintenance' to your growing list of services. 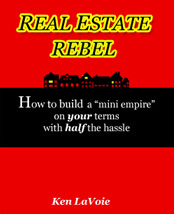 When it comes to marketing you will want to stay away from printed materials as much as possible. While you can find printing companies that try to reduce their environmental impact, printing is never going to be 100% earth friendly. Avoid flyers and brochures and go with other promotional strategies such as online marketing. Don't give your customers a chance to call you a hypocrite. Part of caring for the environment is the conservation of water. Lawn care businesses are responding to changing attitudes by offering irrigation solutions that use a lot less water than before. Before having an irrigation system installed, customers will likely want to know how much water the system will use and if water consumption can be minimized. Lawn care operators can strengthen their clean, 'green' reputations by working together with other environmentally conscious companies. Teaming up with a company doing solar panel installation is one good example. If you do want to be 100% carbon neutral then you may have to consider offsetting the carbon emissions from your vehicles by purchasing carbon credits through an organization like Carbonfund.org. Lawn care businesses who position themselves to exploit this niche in the long run will do well as there are always customers who will pay a premium price for this kind of unique service. Consider starting a lawn mowing business that is clean, green and good for the earth and you may just find that it is good for your bank account as well. Make use of the Internet to get the lawn business startup information that you need for free.